Venom Review - Comic Films Push The Envelope - Are You Screening? As the comic genre takes over theaters more and more, part of the overall agenda becomes testing the waters, especially when it comes to broadening the franchise pool. Dr. Strange and Guardians of the Galaxy were calculated risks that hoped to serve up relatively unknown characters to expand the list of heroes people would show up to see, but also to pave the way for many more. We can’t just keep rebooting Superman and Batman, and the world of comics is overflowing with options. More importantly, as the number of titles heading for theaters grows, we have to get more directors into the mix, and we have a prime genre, despite the money potential, to throw in new names, because no one really cares. Like Dr. Strange and GotG, Venom is fronted by a big name who will hopefully manage much of the draw, and it’s directed by someone you’re unlikely to have heard of before. Ruben Fleischer at least has the benefit of Zombieland, Gangster Squad, and a lot of TV, but he enters the blockbuster comic field an unknown quantity. The problem with Venom is that we don’t have a good guy, and there’s no real effort at comedy. That means the movie has to sell us a character we probably don’t want, and can’t lull us into a comfortable familiarity with silly gags and a nostalgic soundtrack. Tom Hardy is no stranger to the idea of getting an audience to come along for a ride they may not be eager to join, and the best moments to be found here are when he is chatting with his alter ego, but the film seems to be made by someone who doesn’t particularly like it, which is a serious uphill battle for an actor. Photo Credit: Frank Masi © 2017 CTMG, Inc. All Rights Reserved. 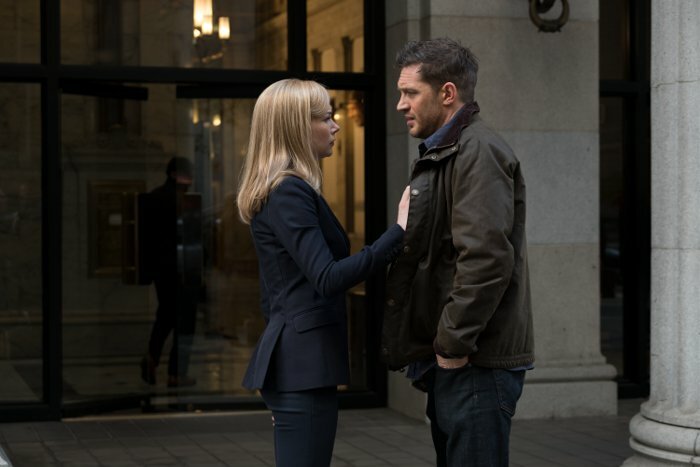 Eddie Brock (Tom Hardy) is an investigative journalist with a knack for overreaching and getting himself in trouble and/or fired, and he has his sights set on Carlton Drake (Riz Ahmed), owner of the super-corporation responsible for the space exploration, because they are obviously up to no good, even before the whole alien thing starts. The film tumbles its way through stock plot devices and action scenes, more concerned with explosions and a villain who can’t stop twirling his mustache than building a character or crafting a story that is worth exploring. To be fair, Venom, even theoretically, is an entity that creates matter, so paying attention to science is out the window. Unfortunately, this is a film that takes that to mean that making sense of any kind is unnecessary. Even the fun there is to be found here, largely by way of Hardy’s ability to talk to himself and underused support like Jenny Slate‘s whistleblower, is overshadowed by a determination to make villainy and genius in general something that is ultimately buffoonish. Venom works, as a character or a story, because it offers up a unique look at two personalities forced to work and exist together, and obviously provides some perspective on our own internal struggle with the facets of our psyche. Sure, killing bad guys in weird ways and having a creepy face floating over your shoulder doesn’t hurt, but despite the apparent beliefs of the uninitiated, comic characters don’t become popular because comics have great special effects. If there is any exploration of any character that happens in Venom, you have to bring it with you, because the film offers so little of its own that it actually becomes a jarring misfire when Venom opens up to Eddie toward the film’s end. 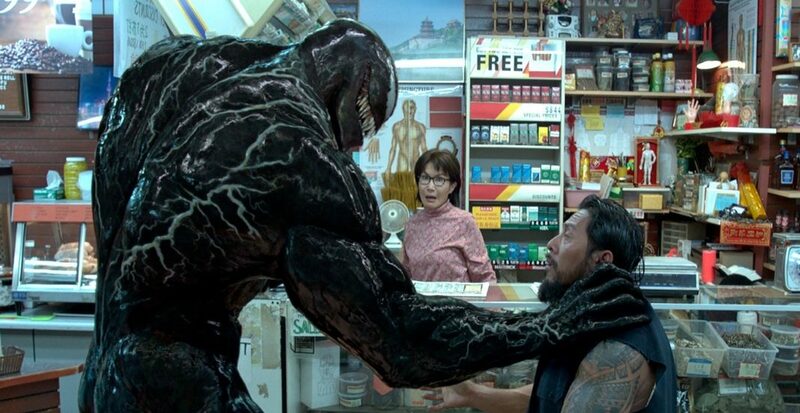 There are brief moments when Eddie throws out a fortune cookie line, or curses himself for the loss of his fiancee (Michelle Willaims), but when Venom tells Eddie that he changed because of Eddie, it isn’t simply a movie-esque leap with little evidence, it is something that just can’t be true. Tom Hardy is fun to watch no matter what he’s doing, and there’s a motorcycle chase that is popcorn fun of the highest order, but there is a sense in which there is no actual movie here at all, much less a decent one. It’s a collection of stunts and special effects spliced together practically at random. When Hardy isn’t on screen, which thankfully isn’t often, the lines might as well all be improvised, because they aren’t relevant beyond (say something vaguely sinister).